There’s a new ad popping up on YouTube before videos about a man named Thomas Peterffly. The short version of the story is that he was an immigrant from communist Hungary who came to America and experienced “true freedom”. This video that is available on, what I think, is his YouTube channel. It has his name on it but it doesn’t link to anything or really give any information. The purpose of these videos (at least the two that I know of) was to support the Republican Party over the Democrats, with the illusion that they are socialists. I personally have not come across this ad, but someone linked me to it. So I decided to take a look at it and write down some thoughts that came to mind on it. Initially, this is video is a usual obnoxious anti-Obama propaganda ad. By that I mean it makes the ridiculous implication that Obama is a socialist and that he is going to turn the country into the Soviet Union. Which will immediately is just a complete non-sequitur, because these kinds of people always imply that partially social health care is automatically socialism. They take single aspects that a socialist county may or may not have and then draw the illogical conclusion that it therefore must be socialist. Now I will go further on a critique the video. He says that the nation of Hungary where he came from became poorer and and poorer without explaining, he doesn’t back up it, so its total “question begging”. Its a bold assertion with nothing to back it up. We’re supposed to take it at face value that socialism is bad based on another bold assertion without backing it up. But I do have some real information on it. For starters during the time in which he lived in Hungary (1944 – 1965) it was being destroyed from and rebuilding from WW2. So really complaining that there wasn’t say, a mass abundance of consumer goods during that time is really ridiculous. It would be equally ridiculous to complain that life wasn’t comfortable or easy. They were in the middle of a war when he was born. During that time the war had crippled industry in the country. In fact according to historians about 40% of of national wealth, including all bridges, railways, raw materials and machinery were destroyed. An important point to keep in mind here is they supported the Nazis and also had a fascist state headed by different people running the country. They agreed to go along with Nazi Germany and sent troops to aid the invasion of the Soviet Union. They decided take the country into war with the Soviets that devastated them. Afterwards while occupied by the Soviets they agreed to pay war reparations approximating US$300 million, to the Soviet Union, Czechoslovakia, and Yugoslavia, and to support Soviet garrisons. The Hungarian National Bank in 1946 estimated the cost of reparations as “between 19 and 22 per cent of the annual national income.” In spite of this, after the highest historical rate of inflation in world history, the new, stable currency was successfully introduced in August 1946 on the basis of the plans of the Communist Party and the Social Democratic Party. While consumer goods production was still low, industrial production exceeded the level of 1938 by 40% in 1949 and tripled by 1953. Its a proven fact that the devastation carried out on the country was the result of the country’s own fascist party. Who allied with Hitler leading into the devastation that occurred. 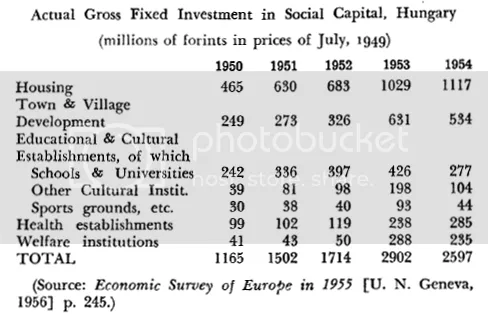 Despite the strong and baseless claims made by people like Peterffy, the Nazis were not socialist, they were in fact capitalist and profit motive driven. Merely pointing to the name doesn’t correspond to what they actually did, its completely superficial. Attributing this to socialism is completely contemptible. By comparison Iraq in 1970 established in its constitution that the country was “a sovereign people’s democratic republic”. Therefore America’s claim that it was a dictatorship used as a second justification for invasion is false. It wasn’t until 1949 that socialism began in Hungary, it is after the Soviet occupation ended. The real development of the nation took place from 1950 to 1955. This was the first five year plan that had numerous achievements. There was a large reduction in infant mortality, school for children went from having to stop at 5 years out of necessity to almost all children getting 8 years. In 1927-38 there were 305,000 children in schools, in 1955 there 1,225,000 children in schools. Most school before socialism were one room buildings, after socialism there were less than 300 of these left. The number of teachers went from 26,000 to 40,000 by 1953. The Hungarian People’s Republic assured the liberty of the free expression of one’s religion. This was done by eliminating religious control over the government. Something that has yet to be achieved in America today. Also during this time religious discrimination was removed and Jews were no longer persecuted and were equal under the law. Damage that had been done under the anti-Semitic fascist party had ended. Here we can see how the important areas of industry and agriculture were developed quite well. It was in fact one-sided, with much more emphasis on heavy industry than light, or consumer goods. Perhaps this is what Peterffy meant when he said “no hope”, not being able to go out and buy the latest this and that, because in the capitalist mindset happiness can’t exist without buying things. What good is increased living standards, religious freedom, increased education and industry when you don’t have large abundance of unimportant consumer goods right? All of this occurred during the time in which Peterffy actually lived in Hungary. These accomplishments were the result of the destruction of fascism and the construction of socialism. This runs quite counter to the vague claims put forth by Peterffy in his Republican campaign video. In addition to this, despite his claim in the video, the people of Hungary were not only quite happy to see a drastic increase, they were quite proud of it as well. Now let me continue with the rest of his claim in the video. He asserts, like all reactionaries, that US success comes from those that work hard and have a drive for success. Reality is quite contradictory from his claim. The United States actually holds a quite privileged position in the world, not from hard work, but from the theft of land killing over a hundred million people, slavery and unending wars of conquest for markets and the access and control of natural resources. The idea that those at the top who worked very hard is fallacious. The work of tens of millions of every day Americans actually carry out the basis for the wealth that these elites (like Peterfy at an estimated $5 billion) actually have. Their wealth doesn’t exist without the exploitation of billions in the Third World as well. There are people working to clean his office who work 10x harder than he does. The wealth of the United States has an extremely shady, exploitative and genocidal basis. The killing continues to this day to maintain it. From here he claims that “bad mouthing” success takes away the incentive the successful have that help the needy. This relies on the logical fallacy held by free market believers that capital and labour have the same interests. This is just simply false. Capital only has its profits because they were extracted away from labour. In truth we can prove quite the opposite. 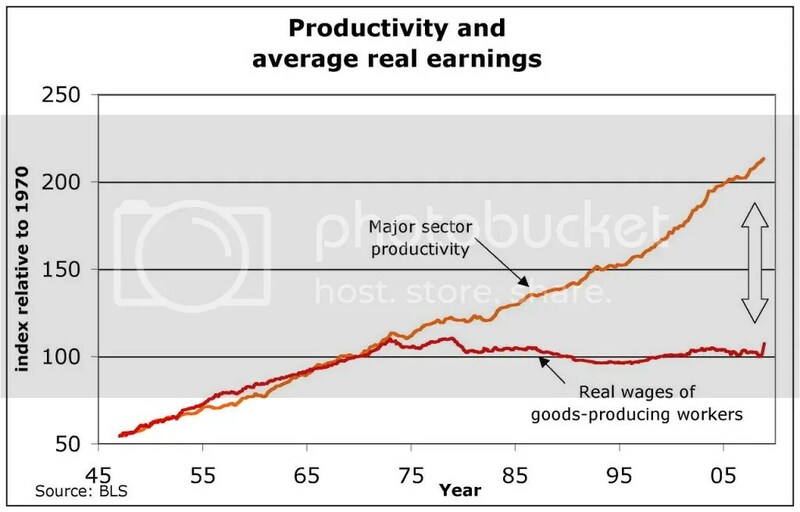 We can show that as profits increased, the wages earned by labour were nowhere near corresponding. The “bad mouthing” is over the devastating effects his class has had on the economy of the US and the world. His class, financiers, who lead the world into a global economic collapse. Which is what he does through Interactive Brokers Group. The mass increase in global food costs, the loss of tens of millions of homes, the destruction of countless jobs here and around the world. The devastation of Europe through the same financial lunacy. There is untold destruction played upon the entire world. His class destroyed the middle and working class, that is what people are mad at. In his defence he tries to claim that us regular working class people only have, and exist because of people like him. No, the world is messed up because of people like him. His ads that he has running, are nothing more than a plea to save his classes interests, so they may maintain their privilege and wealth.